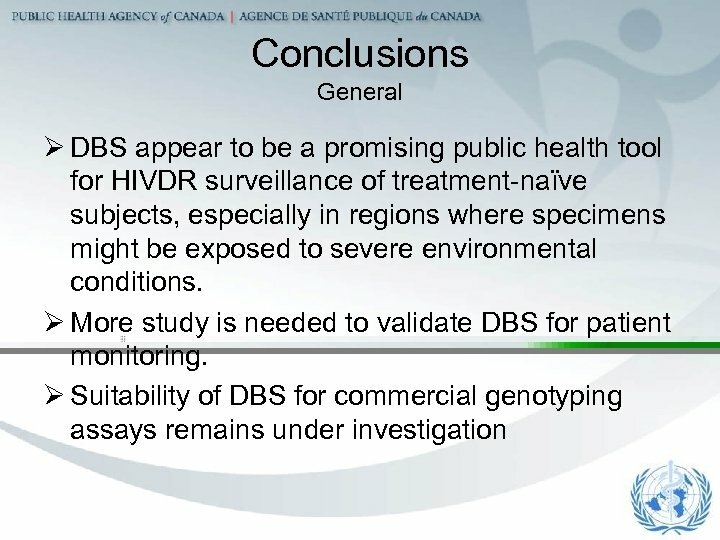 DBS in HIV Surveillance and Monitoring DBS have been reported in peer reviewed scientific literature to be suitable for: ØHIV serology ØHIV molecular diagnostics ØHIV viral RNA quantification (viral load). 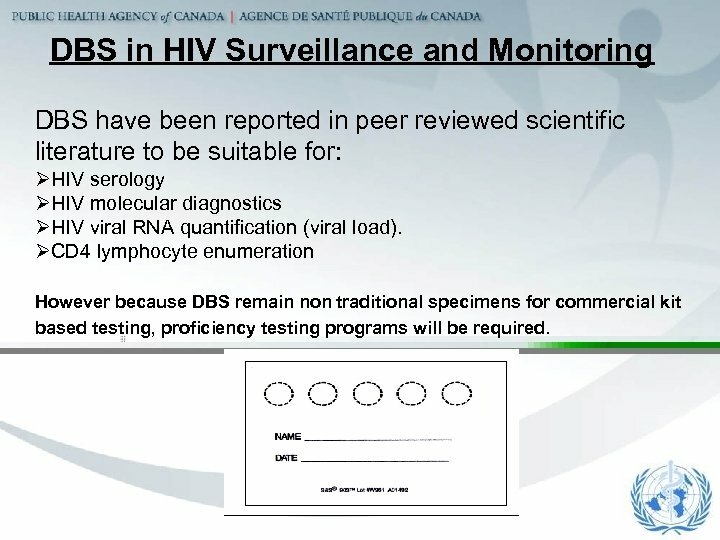 ØCD 4 lymphocyte enumeration However because DBS remain non traditional specimens for commercial kit based testing, proficiency testing programs will be required. 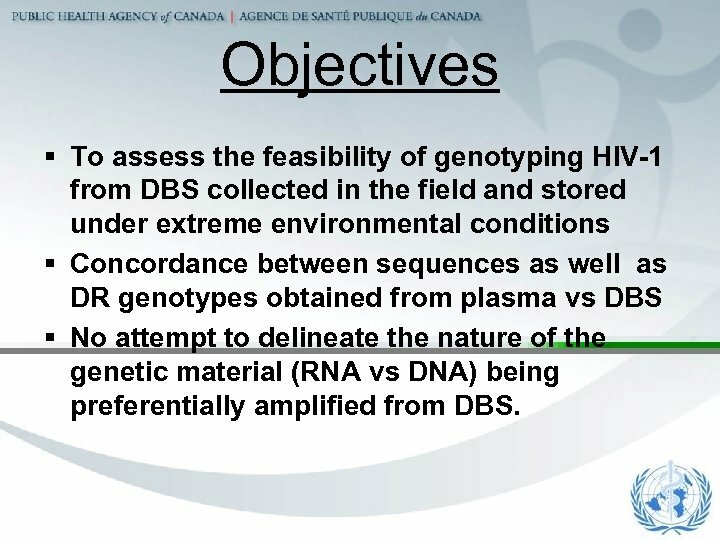 Objectives § To assess the feasibility of genotyping HIV-1 from DBS collected in the field and stored under extreme environmental conditions § Concordance between sequences as well as DR genotypes obtained from plasma vs DBS § No attempt to delineate the nature of the genetic material (RNA vs DNA) being preferentially amplified from DBS. 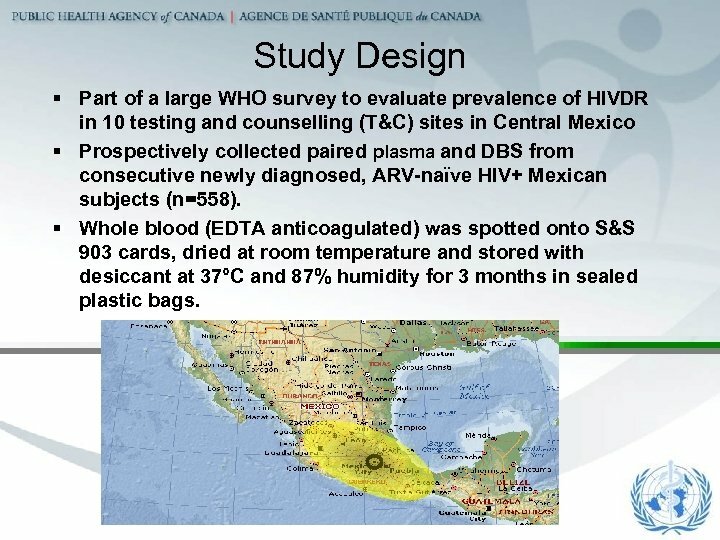 Study Design § Part of a large WHO survey to evaluate prevalence of HIVDR in 10 testing and counselling (T&C) sites in Central Mexico § Prospectively collected paired plasma and DBS from consecutive newly diagnosed, ARV-naïve HIV+ Mexican subjects (n=558). 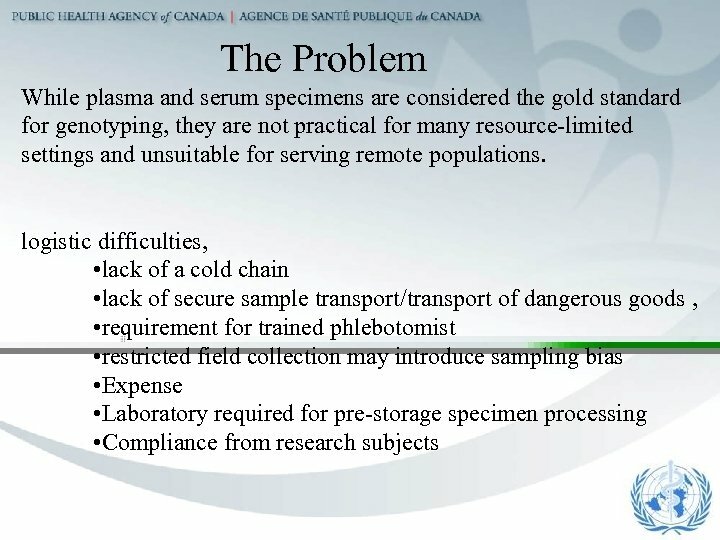 § Whole blood (EDTA anticoagulated) was spotted onto S&S 903 cards, dried at room temperature and stored with desiccant at 37°C and 87% humidity for 3 months in sealed plastic bags. 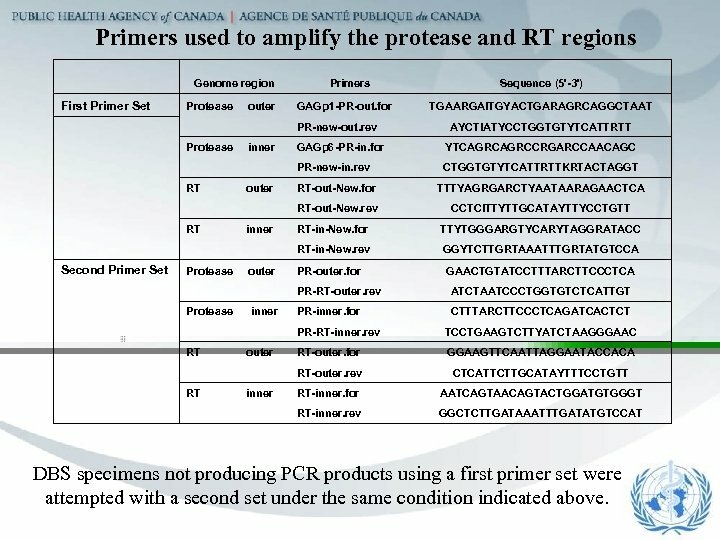 Primers used to amplify the protease and RT regions Genome region Primers Sequence (5'-3') First Primer Set Protease outer GAGp 1 -PR-out. for PR-new-out. 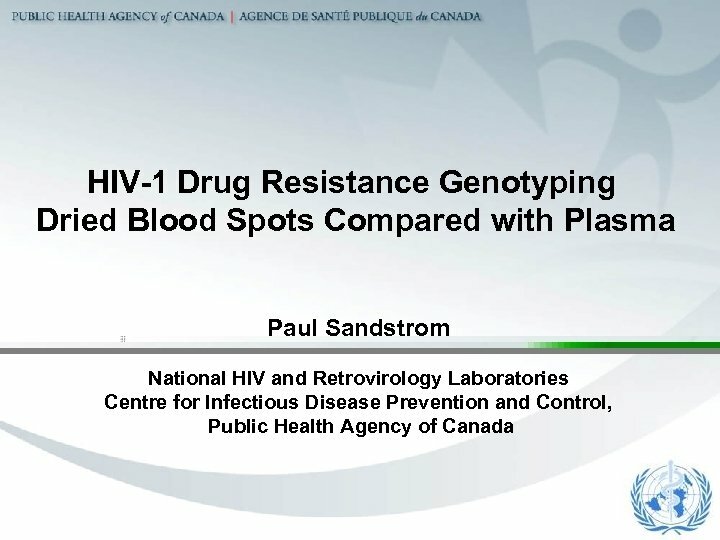 rev Protease inner GAGp 6 -PR-in. for YTCAGRCCRGARCCAACAGC PR-new-in. rev CTGGTGTYTCATTRTTKRTACTAGGT RT outer RT-out-New. for TTTYAGRGARCTYAATAARAGAACTCA RT-out-New. rev CCTCITTYTTGCATAYTTYCCTGTT RT inner RT-in-New. for TTYTGGGARGTYCARYTAGGRATACC RT-in-New. rev GGYTCTTGRTAAATTTGRTATGTCCA Second Primer Set Protease outer PR-outer. for PR-RT-outer. rev ATCTAATCCCTGGTGTCTCATTGT Protease inner PR-inner. for CTTTARCTTCCCTCAGATCACTCT PR-RT-inner. rev TCCTGAAGTCTTYATCTAAGGGAAC RT outer RT-outer. for GGAAGTTCAATTAGGAATACCACA RT-outer. rev CTCATTCTTGCATAYTTTCCTGTT RT inner RT-inner. for AATCAGTAACAGTACTGGATGTGGGT RT-inner. 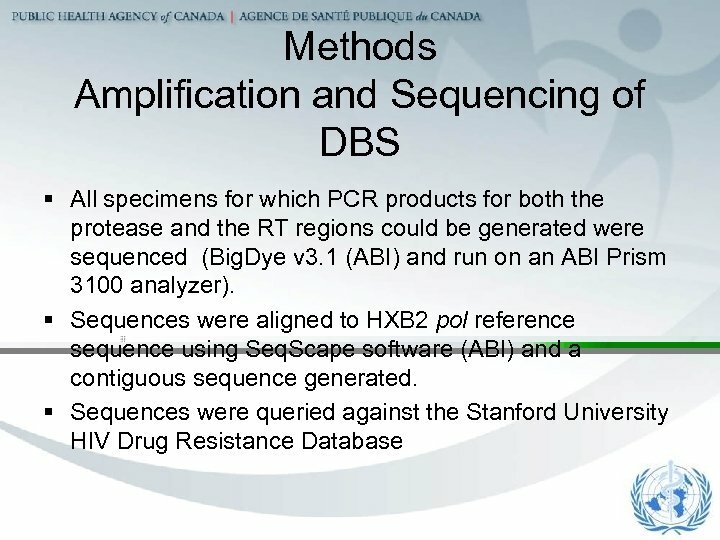 rev GGCTCTTGATAAATTTGATATGTCCAT TGAARGAITGYACTGARAGRCAGGCTAAT AYCTIATYCCTGGTGTYTCATTRTT GAACTGTATCCTTTARCTTCCCTCA DBS specimens not producing PCR products using a first primer set were attempted with a second set under the same condition indicated above. Results Ø 90. 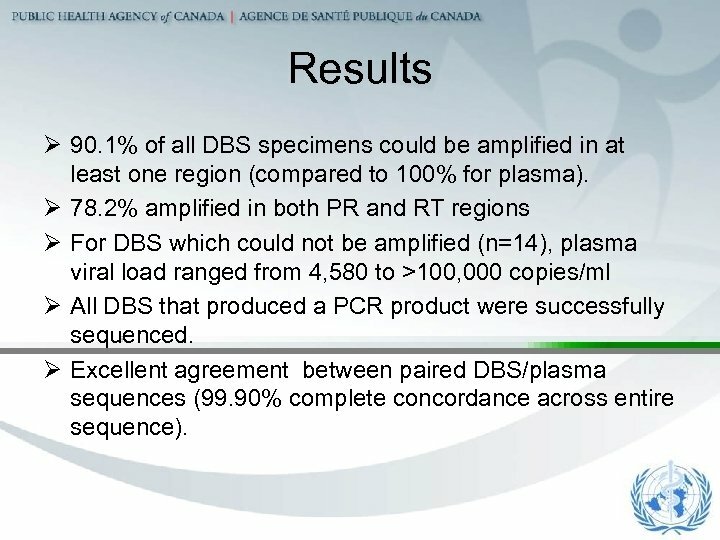 1% of all DBS specimens could be amplified in at least one region (compared to 100% for plasma). Ø 78. 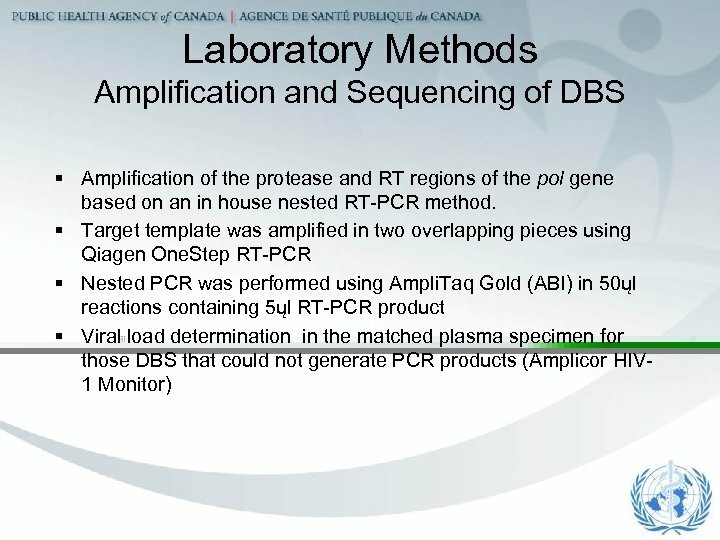 2% amplified in both PR and RT regions Ø For DBS which could not be amplified (n=14), plasma viral load ranged from 4, 580 to >100, 000 copies/ml Ø All DBS that produced a PCR product were successfully sequenced. 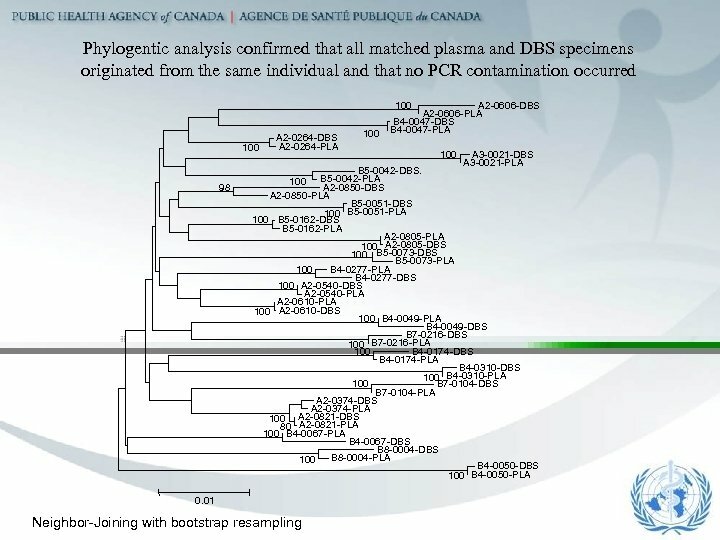 Ø Excellent agreement between paired DBS/plasma sequences (99. 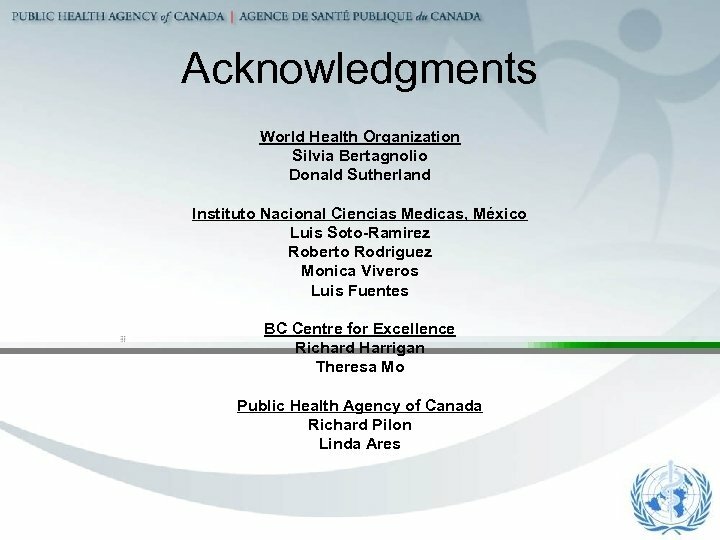 90% complete concordance across entire sequence). 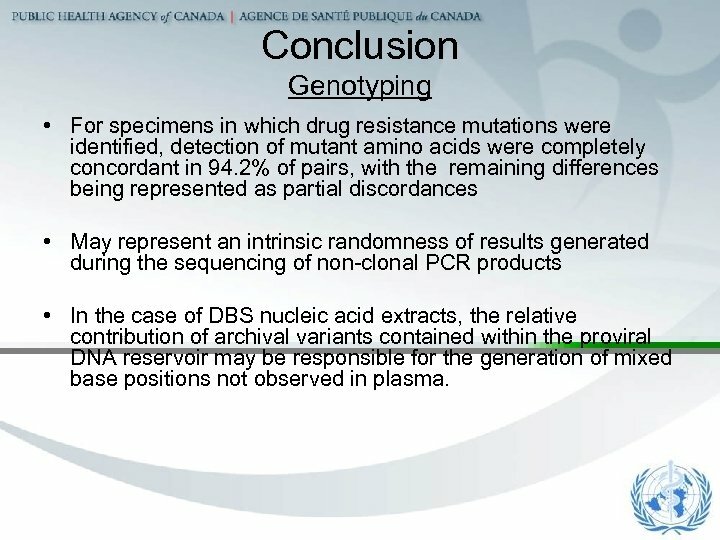 Conclusion Genotyping • For specimens in which drug resistance mutations were identified, detection of mutant amino acids were completely concordant in 94. 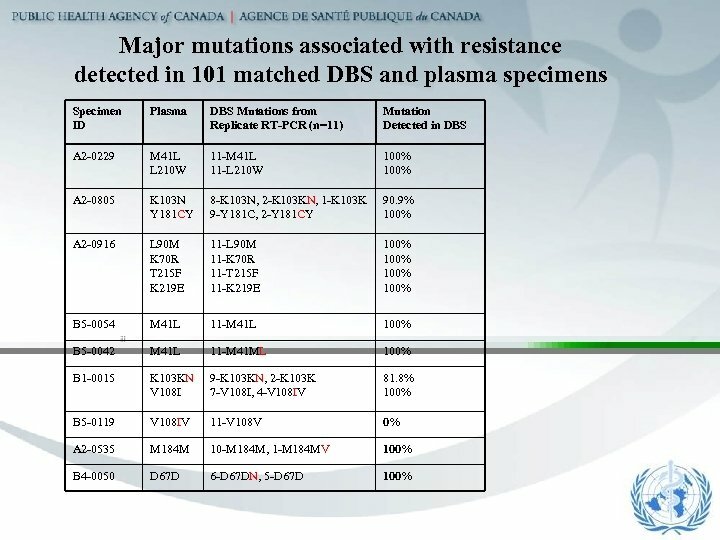 2% of pairs, with the remaining differences being represented as partial discordances • May represent an intrinsic randomness of results generated during the sequencing of non-clonal PCR products • In the case of DBS nucleic acid extracts, the relative contribution of archival variants contained within the proviral DNA reservoir may be responsible for the generation of mixed base positions not observed in plasma. 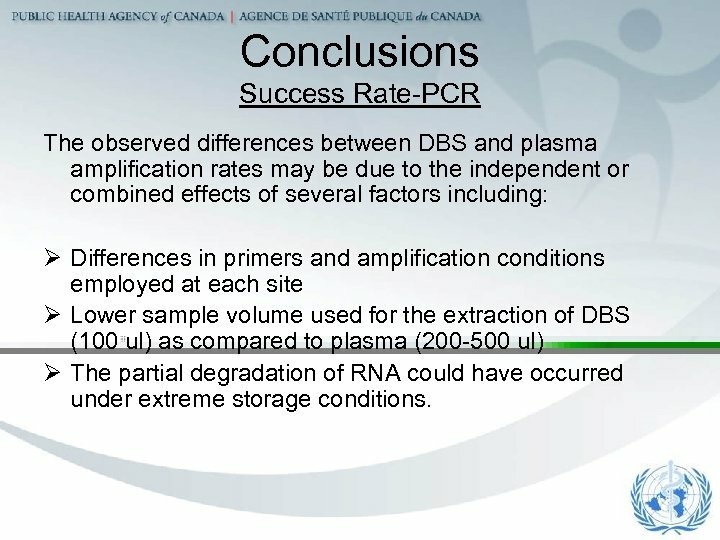 Conclusions Success Rate-PCR The observed differences between DBS and plasma amplification rates may be due to the independent or combined effects of several factors including: Ø Differences in primers and amplification conditions employed at each site Ø Lower sample volume used for the extraction of DBS (100 ul) as compared to plasma (200 -500 ul) Ø The partial degradation of RNA could have occurred under extreme storage conditions.